WBO light-heavyweight champion Nathan Cleverly will make the second defence of his title against Tony Bellew in Liverpool on Saturday, 15 October. And promoter Frank Warren hopes the winner of the all-British contest will fight veteran American fighter Bernard Hopkins in a unification clash. Hopkins became the oldest major world title winner when he beat Jean Pascal for the WBC and IBO belts in May. Hopkins is set to fight the Cleverly v Bellew winner in the United Kingdom. 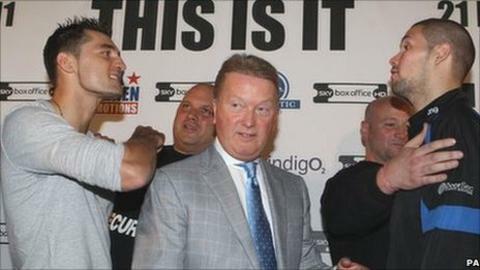 It had been thought that Commonwealth champion Bellew would defend his British title against Paul David on 17 September. But that fight is now off as Cleverly and Bellew, who are both unbeaten, have agreed that old rivalries should be renewed at the Liverpool Echo Arena on 15 October. Bellew was in line to face Cleverly in May as a late replacement after previous champion Juergen Braehmer withdrew. But the 28-year-old failed to make the weight after Bellew clashed with Cleverly in a pre-fight press conference. Cleverly went on to beat Aleksy Kuziemski to retain his WBO light-heavyweight title, but now the British boxing grudge match has been confirmed. "A fight between me and Bellew has been heating up for a long time and now he's ready to be taught a lesson," Cleverly told Frank Warren's website. "He's got a big mouth, but he can't back it up with his fists and this time he's talked himself into big trouble that he won't be able to fight his way out of." Bellew will have home advantage as 'The Bomber' is set for his third successive fight at the Echo Arena following back-to-back victories over Ovill McKenzie. "Cleverly has never knocked anybody out in his life and he's dreaming if he thinks he going to do it to me," said Bellew. "I'll be fit and ready on the night and it's the worst scenario that he could have ever wished for; I'll give him nightmares. "I rattled him at the last press conference, he'll deny it, but he was physically shaking and it's still playing on his mind now. "He can't beat me mentally or physically and he knows that. He may have a touch more speed, but I have plans to counter that." Promoter Warren revealed the winner could fight the legendary Hopkins, who defends his WBC crown against Chad Dawson in Los Angeles on the same night. Hopkins has lost just five of his 60 fights in his 23-year professional career, the last a spilt decision defeat to Joe Calzaghe in Las Vegas in April 2008. "I'm in discussions with Hopkins' promoter Richard Schaefer about a potential fight with the winner," said Warren. "So it's a massive incentive for both guys."